Have you ever been bemused by something you have been told but found a bit unbelievable or wondered why it works? Such as 'dockleaves cure nettle stings', ' put butter on a burn' or 'where do all the odd socks go?'. There are hundreds of such 'Old Wives' Tales. Thomas Browne wrote about them (he called them Vulgar Errors or Commonly-held Misbeliefs) and wrote about his experiments to prove or disprove them in a book called Pseudodoxa Epidemica. Now we want to investigate our own Vulgar Errors of the 21st century so we are running a campaign to find out what people believe today and whether it is true or not. A team from across the Norwich Research Park will choose the best tales to test and find out whether or not there is any scientific basis to them or not. You can fill in the form on the right, or come to Hay Hill on Thursday 19 October where we will be handing out forms to fill in. 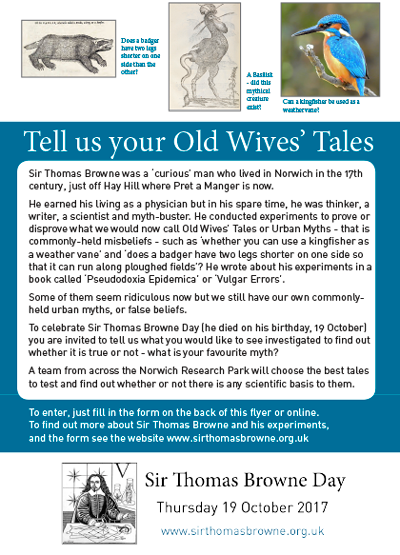 Or look out for them in the Forum throughout the Norwich Science Festival, and in St Peter Mancroft Church. Information will only be used in relation to the Thomas Browne Project, Norwich Hackspace, Culture Shift, Norwich Research Park and SAW and not sold or shared with other companies.